The success is a positive sign for populations of the region’s only native rabbit, which had declined precipitously in recent decades because of habitat loss, hunting, and competition with the introduced eastern cottontail. Seventy-seven New England cottontails were raised and weaned at the two zoos in 2018, almost double the number weaned in each of the past few years. Including animals taken from a breeding colony on Patience Island in Narragansett Bay, about 100 cottontails were released into the wild in Rhode Island, New Hampshire, and Maine last year. The reason for the tremendous breeding success in 2018 is still a mystery, however. The breeding program began in 2010 with six cottontails collected from a wild population in Connecticut. Since then, 163 litters have resulted in 301 weaned cottontails, mostly raised at Roger Williams Park Zoo. The Queens Zoo joined the effort in 2015. Once the rabbits are about 35 days old, they are removed from the zoos and brought to what the biologists call “hardening pens” at Ninigret National Wildlife Refuge in Charlestown, R.I., or the Great Bay National Wildlife Refuge in New Hampshire to become acclimated to natural conditions. After they spend several weeks or months adjusting to the environment, gaining weight, and learning to hide and forage, they are released into the wild. Decisions about which animals are released in which location are based largely on their genetics. “We’re trying to diversity the gene pool and track who’s successfully mating so we’re not over-representing particular genes in any one population,” Holman said. Representatives from each state in the region submit what Perrotti called “a wish list” of how many cottontails they would like to release in their state annually, and based on the number of animals available and their genetic makeup, the rabbits are divvied up and delivered. New Hampshire and Maine have experienced the largest decline in their New England cottontail populations, so they receive animals each year for release. Cottontail populations in Massachusetts and Connecticut are more robust, and wildlife officials there believe they may be able to increase the populations by manipulating habitat rather than augmenting the population with captive-bred rabbits. In Rhode Island, New England cottontails were initially released on Patience Island, which at last count had between 56 and 90 animals, according to T.J. McGreevey, a researcher at the University of Rhode Island who serves as the wildlife geneticist on the cottontail project. A total of 51 rabbits from Patience have been released elsewhere in the past three years, including in the Great Swamp Wildlife Management Area in West Kingston. Another sign of the success of the breeding program is documentation that some of the released animals are reproducing in the wild. New England cottontails released at the Bellamy River Wildlife Management Area in New Hampshire have been reproducing since 2013. 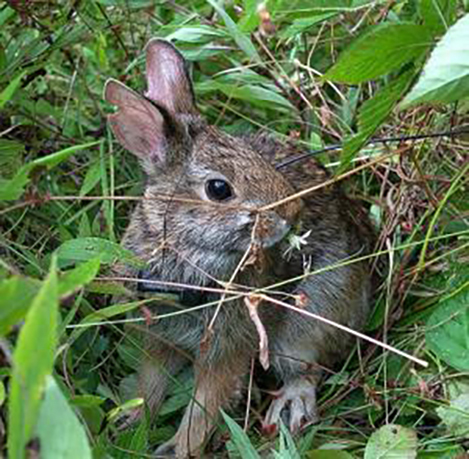 Reproduction was documented among the cottontails released at the Great Swamp in 2017. As successful as the program has been during the past eight years, it’s still well below its target of releasing 500 cottontails annually. To increase breeding capacity, the researchers plan to establish a new breeding colony this year on Nomans Land, a 612-acre uninhabited island off the coast of Martha’s Vineyard. Other islands are being considered for similar colonies in the future. In addition, the Bristol County Agricultural High School in Dighton, Mass., has offered to provide assistance in rearing cottontails for the project. The school has successfully raised several varieties of rare turtles for release in the wild since 2012. Other partner organizations will likely be added in the future. More rare New England cottontails were raised at Roger Williams Park Zoo in Providence and the Queens Zoo in New York City and released into the wild than ever before, according to conservation officials.